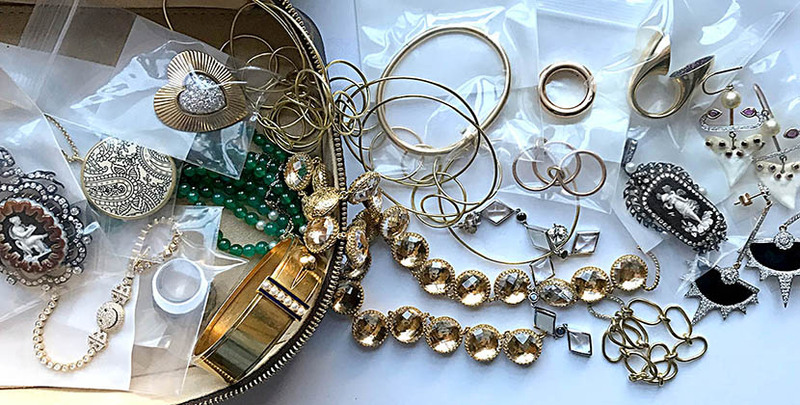 If organizing your jewelry is a New Year’s resolution, I have got you covered with all kinds of ways to get your collection together. It will be a game changer for your routine, because let’s face it tracking down a missing earring or finding your chain necklaces somehow got tangled in a ball after you took them off is the worst. We’ve all been there. The right storage fixes everything. It prolongs the life of your jewelry. It can add a decorative element to your collection. It’s exactly like organizing your closet. If everything is in a place where you can find it easily, you will wear and enjoy it more. Read on for some ways to store your most prized possessions. You are not going to believe this when I tell you, but the way jewelry professionals pack and store jewelry is in little poly bags. They look like miniature Zip-Lock bags. Why are they the universal packing tool in the trade? They keep metal from tarnishing. They protect pieces from scratching one another. You can pile them all together in you travel pouches. And everything is visible. 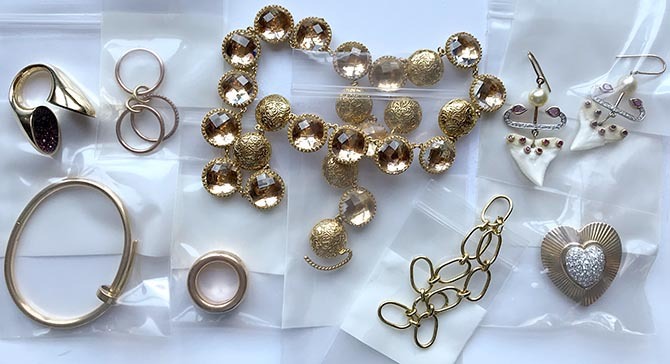 Order bags in the 2” x 3” size for rings and 3” x 6” for bracelets and necklaces. For earrings, put one in a 3” x 6” bag with the second in a smaller bag within the big bag. In other words, keep the earrings together but in separate baggies. For necklaces let the chain hang out of the bag so it doesn’t get tangled. These small bags are sold in parcels of 100 for around $18. That may sound like a lot of baggies and it is, but they are small and once you start to use them for travel or storage at home, you might just become obsessed. I know jewelry folks who use them to tidy up everything in their junk drawer. For the jewelry lover who wants their jewelry out where they can see it, there is the decorative option. If you have an antique hoarding tendency like, um, this writer, go on the hunt for mismatched cups and saucers, vintage tins or small vanity trays. 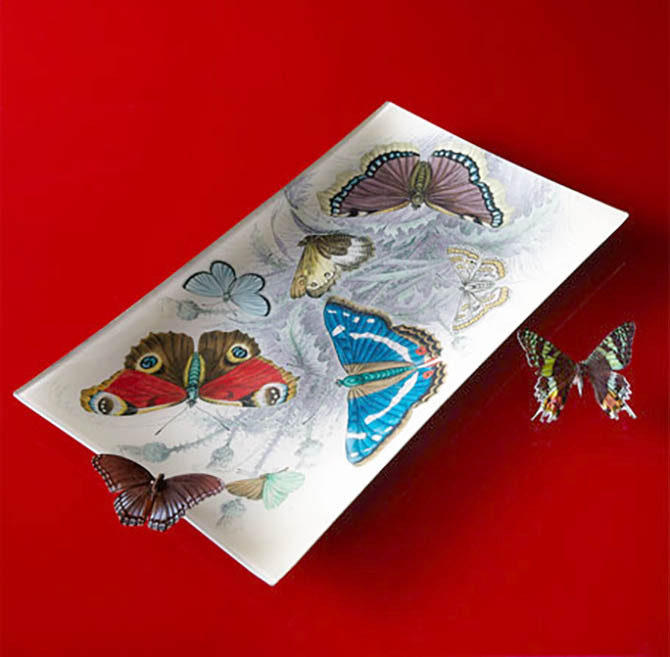 Porcelain dishes from John Derian or Tiffany’s new home collection are other options. Whatever decorative display you decide on be sure your choices are in the small to medium size range. 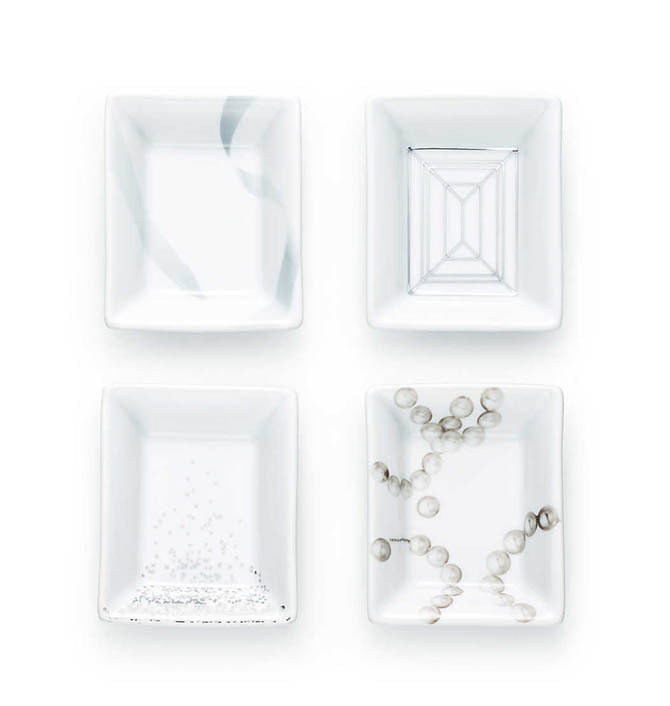 A large tray can put you right back where you started with a jewelry mess. There is just something about a jewelry box that is so old-fashioned, and we’re not saying that in a bad way. 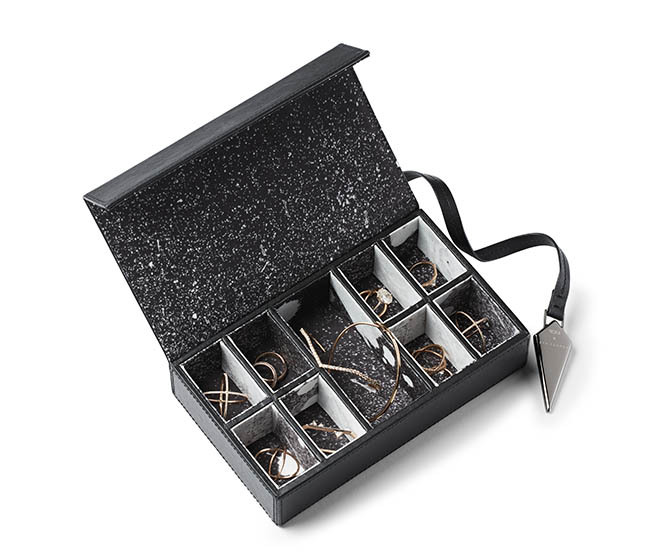 The classic jewelry box is still around for a reason. Everything has its place and space and it looks as glamorous as the jewelry inside. Today, jewelry boxes are having a bit of a renaissance. Jewelry designer Eva Fehren recently made a sleek black ring box for the luggage brand Tumi. 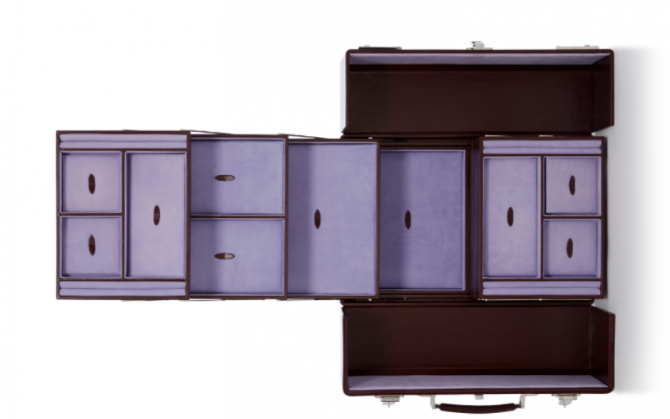 Globe Trotter released a limited-edition trunk in a vintage style celebrating the release of Murder on the Orient Express that sold out rapidly. 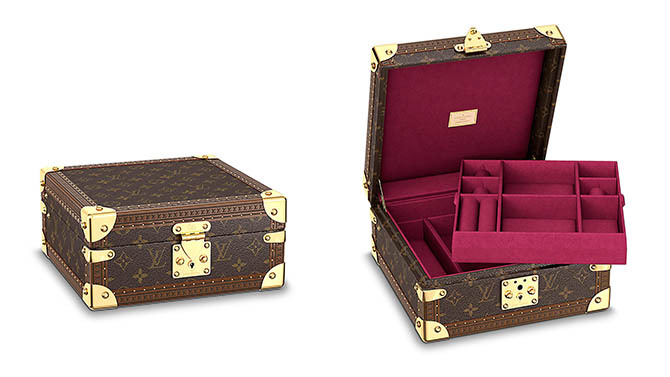 Louis Vuitton is another classic place to find a jewelry box. Asprey just released a doozy. The large leather cantilevered box is the ultimate item for someone with a collection on par with Elizabeth Taylor. The price tag is a whopping $13,550. Of course, if I had the dream piece, all my jewelry stored inside would be in little poly bags.